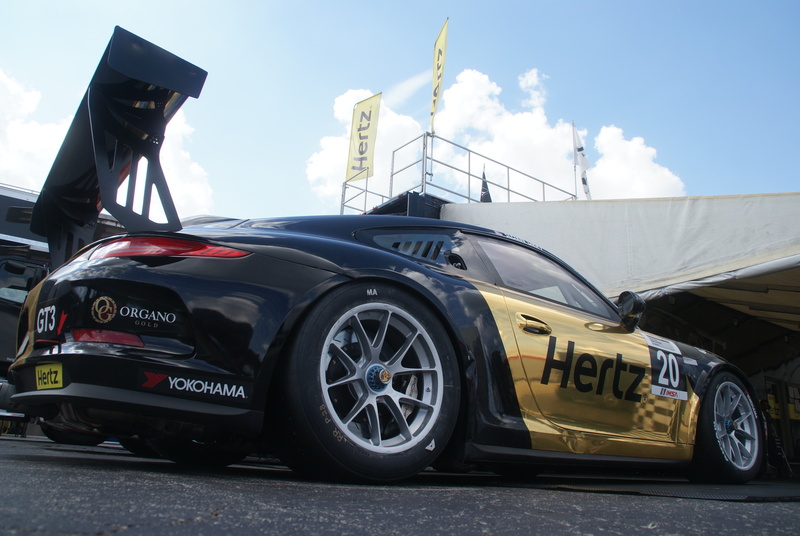 Ft.Collins, CO – Following a spectacular finish in the previous round of the Porsche GT3 Cup Challenge USA by Yokohama Championship at Circuit of the Americas in Austin, Texas, Sloan Urry and JDX Racing were looking for a little luck and some strong results to finish the 2014 race season. 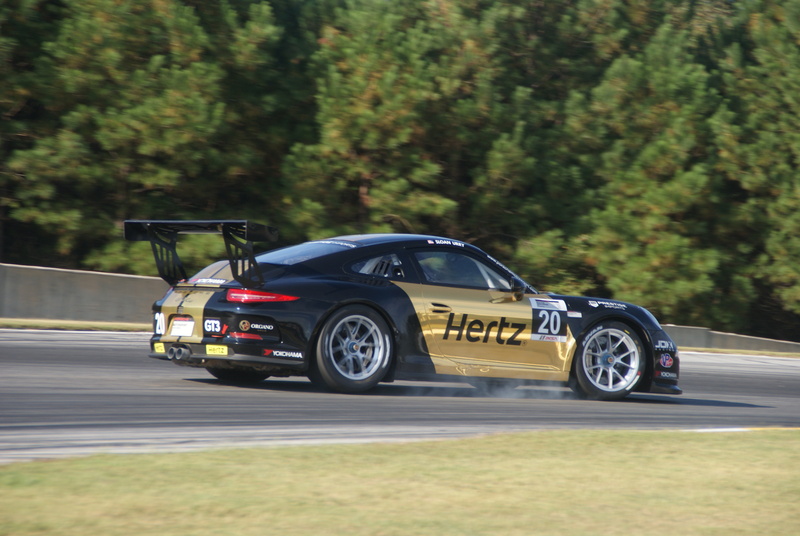 Urry managed to qualify the #20 JDX Racing / Hertz Porsche on the inside of row two for both races of the weekend at Road Atlanta, so with job one done, the entire team was ready to go racing. Caution free races at Road Atlanta are rare, however the car was set up to do a long run, so that option (which materialized in race one on Thursday) presented a nice opportunity. The start wasn’t ideal with Sloan slipping to fourth on the run up the hill out of turn one on lap one. That left Sloan fighting hard with the very quick rookie Jesse Lazare. In (successfully) defending his position, the leaders managed to leg out a five second gap – and though Urry was matching or beating the leaders lap times late in the race, it was too little too late. Sloan had to settle for fourth. Friday morning the skies opened and in the final race of the season, IMSA declared the start of the race wet – mandating that all teams start on purpose built wet weather racing tires. Race control advised the field to “pack up and pair up”, and as the field of 26 Porsche GT3 Cup Cars exited under the bridge at turn 11, the green flag waved very early, bringing the cars down the hill into the 100+ MPH turn 12 – on a very wet racetrack. The wet track surface proved to be no match for the mix of the Porsche horsepower and Yokohama rain tires (which are very good – but even the best rain tire can only move so much water). The #5 car of Michael Lewis spun, Sloan reacted and ended up hydroplaning and making contact with the inside wall – ending his race and his season – just as quickly as he crossed the start / finish line. The 2014 Season certainly had it’s share of highlights though. The team had limited time with the new specification Porsche GT3 Cup car as they took delivery just prior to the season opener at Sebring. JDX race engineer, Luke Goldenstein, along with Sloan Urry’s feedback managed to build a quicker race car round by round, and the results speak to the teams efforts. Sloan, along with JDX Racing managed to claim ten top five finishes in the 16 round season. Of those top finishes, Sloan visited the podium seven times, three of which were race wins at Canadian Tire Mosport Park, Road America and Circuit of the Americas. Stay tuned to www.jdxracing.com and follow us on facebook at www.facebook.com/jdxracing for news and announcements on our plans for the 2015 race campaign.